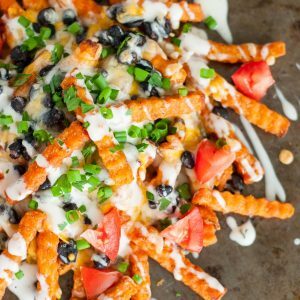 Whenever I have a lone bag of french fries in my freezer, or a sweet potato just begging to become snack food, I bake them up and make Loaded Mexican Sweet Potato Cheese Fries. Like nachos; only better! Shall we all get a chuckle out the fact that I’m already planning my Cinco de Mayo menu? This probably comes as no surprise, as I look forward to literally any opportunity to combine jalapeños, black beans, guacamole, and copious amounts of cheese. You could probably argue that I live most days like it’s Cinco de Mayo. You’d probably be right. Case in point? It’s March (my birthday week no less!) and instead of wondering which type of cake I’d like to request, I’m sitting here thinking about how to justify having nachos for dinner. Ooh! Ooh! I know! St Patrick’s Day! Thursday! Irish Nachos! YAAS. 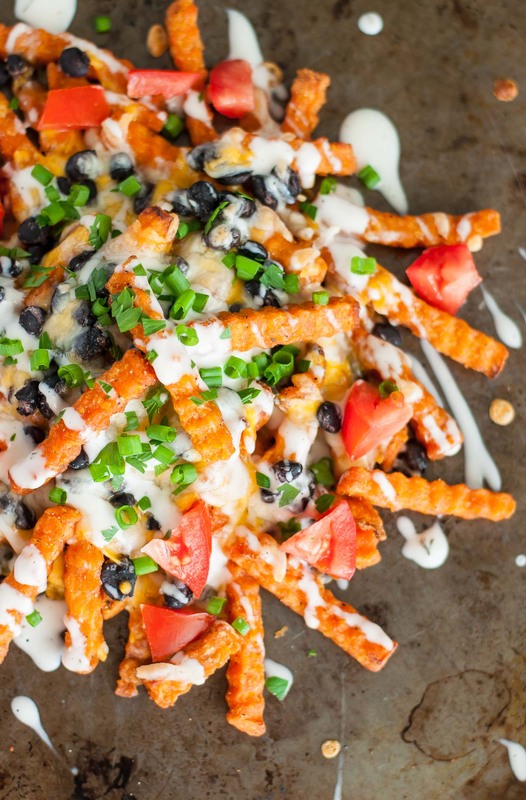 This super easy freezer hack takes a bag of of lusciously crispy sweet potato fries (or regular fries if that’s your thing) and turns them into the most epic sweet potato nachos. Sort of like this recipe with a sneaky little shortcut. It seemed sort of silly to blog these but whenever I post a photo one of our epic loaded sweet potato nacho faceplants on Instagram or Snapchat I’m inundated with requests for more info. Guys, they are SO SO SO stupid simple to make! And customize! And EAT. As an added bonus, I almost feel like they’re more substantial than regular nachos. Whether you’re baking up your own fries from a freshly sliced sweet potato or cheating like I occasionally do and snagging a bag of frozen sweet potato crinkles, they’re full of way more nutrients than deep fried corn tortilla chips and by default, healthier. Yes leave it to me to say the words healthy and nachos within the same general vicinity and then SLATHER THEM WITH CHEESE. My issues run deep. I’ve actually cut back on the amount I consume (WHAT!? I KNOW!) but today? Today we go all out! This is whole food junk food at it’s absolute best. Choose all your favorite toppings and snack happy! Snag your favorite bag of frozen sweet potato fries or regular fries and and bake according to package instructions. I like to flip mine halfway to make them extra crispy! Feel free to think outside the box with this concept and use anything from curly fries to waffle fries to tater tots as your base. Bake your fries according to package direction, or opt for homemade by roasting sweet potato slices or wedges. Flip halfway for extra crispy spuds. 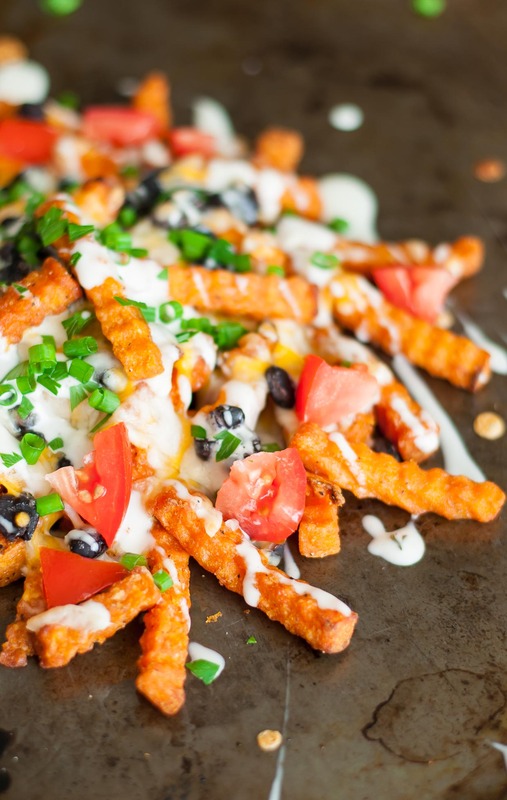 Arrange in a small pile in the center of a baking sheet and top with cheese, beans, and any veggies you'd like baked into the cheese fries, like jalapeños. Return to the oven for 15 minutes, or until cheese is hot and melty. Top with all your favorite veggies, sauces, and toppings and dig in while it's hot! AMAZING recipe. Definitely pinning this to my healthy recipes to feed my boyfriend without him knowing it haha. Oh my goodness, I loveeeee loaded sweet potatoes because of you, and now this — perfection!! ? Definitely making these this week! You are a genius. Let’s get together for margaritas and these… oh so many of these! Happy Birthday Week. It’s my b-day week too. Cheers mamacita. Okay these look like heaven on a plate! I am going to have to make them like right now! We must be twins. My birthday week too! 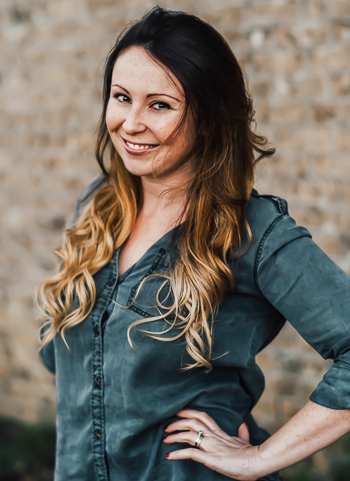 Another mom of a toddler! Another sweet potato devotee! I love this kind of food, simple, easy and just plain fun to eat. I would love to faceplant into this recipe…yummmm! Ohmgyosh YUM! Love it Blair! Wonderful recipe! I love how lovely those fries look baked!